Selecting its Zurich, Switzerland, lab to grow its research wasn’t an opportunistic hiring decision. It was strategic. Google announced yesterday that it will grow its research at its Zurich, Switzerland, lab to include research in the fields of machine intelligence, natural language processing and machine perception—all branches of artificial intelligence (AI) and machine learning. Google has frequently stated AI and machine learning will play a significant role in its future. To learn why Google chose its Zurich lab for this research, I asked Dr. Felix Moesner, CEO of Swissnex. Swissnex is a technology consulate located in Cambridge, Massachusetts, that promotes collaboration between Switzerland’s universities and industry and their peers in Cambridge. Zurich, widely recognized as a world banking center, is also a powerhouse for university and industrial research. It is the home of Swiss Federal Institute of Technology in Zurich (ETH) where Albert Einstein received his PhD. A technically educated Cambrian (person from Cambridge) relocated to Zurich would find its university-inspired community familiar. Google is pursuing a global pool of specialized talent in Zurich to enlarge its research center. AI and machine learning are very academic pursuits, with most research still taking place in university labs. Google is looking to find people with the right skills and education to help create its future of intelligent systems that can perceive, interact and communicate with the real world like humans. The academic bias of AI and machine learning research makes locating near a leading technical university essential for recruiting the best talent and to foster ongoing research with university labs. The Max Planck ETH Center for Learning Systems located in Zurich was founded by ETH and the Max Planck Institute to undertake basic research into fields Google has a deep interest. The center is investigating theoretical principles of learning and how it can be applied to real machines to evolve machine learning and machine perception. The goal is to understand how machines can learn like humans, independent of learning a task. For instance, a human does not need to be repetitively trained to navigate difficult terrain, whereas machines must by ingesting and processing massive amounts of data. ETH Zurich is considered a peer by MIT, and both institutions collaborate on research. It has a larger number of students, and it ranks in the top 20 in some some surveys of the top 10 technical universities in the world. Zurich is on a short list of places that companies consider when planning a new research facility in fields such as computer science, material science, biotechnology and pharmaceuticals. Disney, Google and IBM (a four-time Nobel winner for its research in its Zurich Lab) all have invested in research centers there. Novartis, Hoffmann La Roche and Biogen, representing the pharmaceutical and biotechnology fields, also have invested in large labs there. Research is a big decision because large investments must be made years and decades ahead of products that must generate billions of revenue dollars to pay back the investment. 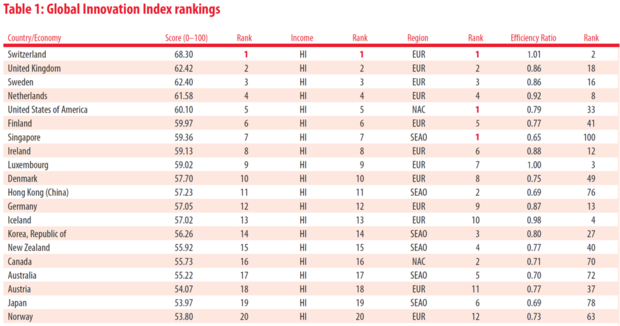 Switzerland ranks first in the 2015 Global Innovation Index compiled by Cornell University, Insead and the World Intellectual Property Organization. Zurich is also perceived as an attractive place to relocate. Ranked second among 230 of the world’s cities in the 2016 Mercer Quality of Living Ranking, Zurich leads other AI and machine learning technology hubs; San Francisco is in the 28th position, and Boston is in the 34th position. With more holidays and longer vacations, an expat can completely change his cultural surrounding with a short trip to another country. Flight time from Zurich to Paris is a little over an hour. Zurich’s location usually isn’t a source of friction when persuading skilled and well-educated people to relocate. The close proximity of European cities and Switzerland’s fantastic transportation system makes it possible to reach most European cities, except those in Scandinavia, in about an hour. This feature makes Zurich a true research hub because a researcher can conveniently collaborate with others in lab and university locations in other European cities with just a day trip. It’s so convenient that it would make a frequent American city hopper jealous. It’s doubtful that Google decided to just hire some more PhDs in the Zurich office. The company in its data-driven-style would have quantified all the attributes Moesner described in making this decision.